This week’s featured Meet The Band artist is the Canadian group Within The Fury. 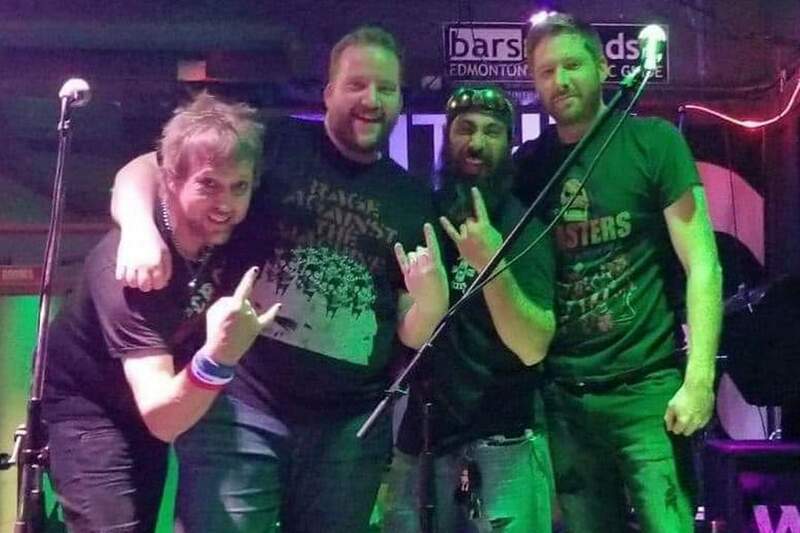 Vocalist Dennis Noonan, guitarist Alex Ferdinandi, bassist Ryan Mattis and drummer Ryan Carreau introduce us to their band. Chad Bowar: Give us a brief history of Within The Fury. Within the Fury started out as an ’80s metal cover band that morphed into a ’90s cover band called The Natural Disasters. At that point the band was going through some changes. But then we found our final lineup. Ryan Mattis rejoined the band after taking some time with his other band. And Adam we found through an ad online. We started to write originals based on his amazing riffs. We found we had a great chemistry for writing music. At this stage we decided to start transitioning to an originals band. We were working on originals while playing small shows as a cover band while we tried to figure out a new band name. We were quite focused on originals content. We were looking for a second guitar playing but after a brief search we decided to try it out with one guitar player. The sound of a three piece music section gives us a different sound compared to other metal/hard rock bands in Edmonton. Once we had the sound, we kept writing material for our debut album Season Of Echoes. We played some gigs while recording but now that the recording process is done, we are aiming to play live more. Describe the songwriting and recording process for Season Of Echoes. Ryan Mattis: The songwriting really starts with Adam and Ryan Carreau. Adam is a riff writing machine. Even his warm up playing contains riffs that blow our mind. When asked what he just played he doesn’t always remember as he is just warming up. (laughs) Anyways, Adam would record riffs or songs he had and Ryan would listen to them and create drum beats that fit the riff. Ryan has a unique approach to the drums where his playing follows the guitar rather than the bass line which allows me as a bass player to really lay down the groove and hold the bottom tight. As Ryan would go through Adam’s song, he would make suggestions of what was working and what wasn’t working. After they had a good structure for the song, they would send Dennis and I a very rough demo/outline of the song. Dennis and I would listen to it and give any other feedback, once we all were digging the song, we would play the song as a group and rework the song into a Within The Fury track. We all have diverse influences and within the songwriting process we all contribute out influences and styles creating songs that flow and have the unique Within The Fury feel. What will you remember most about the recording of the album? Ryan Mattis: For myself it is really two memories: When recording the bass tracks, both of my Thunderbirds were having electronic issues. A lot of humming and static electricity. I had to play my parts without moving at all (which is really hard for me. No matter how I tried the interference still got onto the track. Ryan C. had a hell of a time cleaning up my tracks (which he never fails to mention) but he made them sound great. The funny thing is after we got the album recorded and mixed I was finally able to find the problem with my Birds and got them fixed. My favorite memory will be how much Ryan progressed as an engineer, producer, and mixer. Ryan knew quite a bit about recording but doing an album really pushed him to follow his passion of recording. He would come to every rehearsal or recording session with new ideas and ways to make the album sound great. He wanted the album to sound as professional as possible. We have all heard independent albums that while the songs were amazing the sound quality wasn’t always there. of Ryan’s work and to call him my drummer. He’s my bro and the dude is amazing. The album is a mix of all our influences. Overall, We would say it is a metal album with hard rock leanings. There is a punk vibe throughout but we never follow or sound like one genre. Damn, it is really hard to characterize the sound, it’s the Within The Fury sound, (laughs) but we know when discovering new bands and reading interviews or articles it’s nice to hear what style the band is. So if we had to pick, we would have say a hard rock/metal band. The riffs and structure are more progressive than standard metal but not too progressive that only musicians will appreciate it. It is a very accessible sound and style but with some depth to the riffs that gets your head banging. Lyrically we tackle personal issues either from our past or from our current situation. Dennis writes all the lyrics and he finds a way to express feelings and emotions from his life that everyone can relate to. The lyrics may mean something different to everyone but they are all relatable to real life. Honestly, we are super proud of our music and wanted people to hear it as soon as possible. But in this day and age, it’s really liberating to be able to release an album independently and affordably. The digital platforms such as Spotify and Apple Music are great for newer bands like us to get our music heard, not only locally, but in the world. Other sites such as ReverbNation and Bandcamp have been great in helping us get exposure. There are so many avenues out there to be able to promote your music. At times it’s a bit overwhelming with all the sites to keep track of and updated. As for the physical platforms, we did press CDs as we know people still like to have a physical copy. They’re also good to have at shows so people have a chance to get our album right away. We know there are many people (like us), who want to be able to take the music we just heard home with you. Just in case the evening itself might be a bit fuzzy. As an independent artist it allows us complete artistic control, which is amazing, Everything from the songs, track listing to art work is completely created and designed by the band. Not every decision we make may be right, but we learn from those mistakes and do better the next time. By doing it on our own, it’s really giving us a great understanding of the music business. We’ve got to admit, there is a huge sense of pride (whether we win or lose) that we did it on our own. We did it our way and had fun with it. The response so far has been amazing. We have had so many people comment on how much they love the album. We have had fans who stream the album every day before they start work but still contacted us to purchase a CD for the work truck so they could listen all the time. Not only in the Edmonton area, but due to social networking and sites like ReverbNation and Bandcamp we are getting our music to people all over the world. It blows our mind to see that someone in Sweden or New Zealand has streamed or purchased a digital copy of the album. We were played on Boston Rock Radio which was awesome. The response to the album has been beyond anything we thought. We do want to thank everyone who has taken the time to listen to a track or even to the whole album, interacted with us on social media, purchased a copy of the album, came to a show. Thank you. It means the world to us. What has been your most memorable Within The Fury live show? about 3 weeks. Sometimes the smaller shows can be the most fun. Ryan Mattis: I fell in love with music at a young age. From the time I was 9 or 10 all I wanted to do was play music. When the music bug hit any dreams of being a paleontologist went out the window. (laughs) I started playing bass at 13 and devoured every piece of music I could even outside the metal genre. I love how music makes me feel and can pick me up when I’m down, or increase my happiness when I’m in a great mood. Music has power and I love how it made me feel and it helps me express myself through both playing and stage performance. Playing music is a gift. When I play my instrument either privately or publicly, I get a feeling that is like no other. I become the best me and the me I want to be. Music is a lifestyle and I could not imagine life without it. Adam Ferdinandi: I started playing guitar when I was about 14 or 15. My sister was taking guitar lessons at the time so I would pick her guitar up from time to time. Was a cheap Ibanez with a Floyd Rose bridge that never stayed in tune (not that I knew what I was doing at the time anyways). It turned into an addiction and the rest is history. Ryan Carreau: When I was about 13 or 14 years old, I got my first job as a bag boy at a grocery store. After my very first paycheck, I was on my way home from work and had stopped by my friend’s place. He was playing his drum set and I was really impressed and wanted to try them out, so, I did. I had a blast and learned my first beat. He said I’ll sell them to you. I used the money From my first paycheck I just got to buy it. Bam, I’m a drummer. (laughs) From then on, I just played as much as I could. The first instrument I ever picked up was actually the guitar around age 12, but being a left-handed person, a guitar was hard to come by. So, I just strung up a right-handed guitar Lefty. I still play guitar today and enjoy it whenever I can’t play drums. But the day I bought my drum set was the day I found my true calling and realized drums felt more natural and fun to play. I also found out that it helped a lot with my over-excitement and aggression issues. Let’s just say the drums have kept me out of a lot of trouble growing up. Haven’t looked back since. Dennis Noonan: I would say I was about 16 when I found out, kind of by accident, that I had a singing voice and it really took off from there. Just kept doing it. Ryan Mattis: It was bands like Guns N Roses, Motley Crue, Poison, Bon Jovi, Led Zeppelin, AC/DC that really influenced and inspired me. Duff McKagan from GNR is how I learned bass. I learned every part of Appetite for Destruction and to this day will still sit at home with headphones on playing to that album. I love his style and tone. While I play a Thunderbird due to the Nikki Sixx influence Duff is my all-time fave. As I got older, I expanded and listened to more and more music. The thrash metal of the ’80s (Slayer and Anthrax particularly) really shaped a passion for heavier music. Growing up on the farm country music was always around, and while when I was starting I didn’t like it, as I got older I really became a fan of classic country. I find influence in the lyrical content, being honest but relatable, and song structure. When I learned guitar and started writing my own music, country was a real influence on my song structure. While what I write doesn’t fit Within The Fury’s style these influences still trickle into our songwriting process and my bass lines. Ryan Mattis: A damn long time ago back in ’89 I saw Bon Jovi with Skid Row opening. It was mind blowing for a 10-year-old. I remember my ears rang for a week. Ryan Carreau: My first rock/metal concert was in my small hometown of Kirkland Lake Ontario. It was not very metal, but it was loud! Big Sugar Played the local college and killed it! What’s the best one you’ve attended? Ryan Mattis: There have been so many great ones it’d be hard to narrow it down to one. Bruce Springsteen was amazing, would love to see him again. One of the best, not necessarily the show itself but how it changed my perception of a band, would be Metallica on the St. Anger tour. I had listened to Metallica but they were not my number one. I always went more towards Megadeth and Slayer. My good friend Julia loves Metallica and convinced me to go with her. She said after I see them live, I would understand why she loves them. She was right. The concert gave me a whole new appreciation for Metallica, even the St. Anger songs sounded good live. After that show I became a big Metallica fan and have seen them three or four times since. To me that is what the live show is about. A live performance is how an artist makes fans. Albums are great but a live setting is where a band really shines. In fact, most bands I am big fans of started with a killer live show. Ryan Carreau: This one recently changed for me. In late 2018, I went to see Trivium. I was not a huge fan but had a friend going so I though I’d check them out. I was blown away at how tight this band was. I became an instant fan. What’s the heavy music scene like in Edmonton? Any other bands from there we should know about? The heavy music scene in Edmonton is thriving. There are not as many venues to play, but the ones that are here really support the bands. Fans of heavy music in Edmonton are very loyal and dedicated. No matter who is playing a crowd will be there. Maybe not always a big crowd but a crowd nonetheless. Edmonton loves their metal and heavier music. Another band From the area has been tearing it up for a while now is Striker. They are really blowing up right now. Other Edmonton bands to check out would be Juliet Ruin, Call Of The Siren, Hell County X, Tooth & Nail, Eye Of Horus and Forsaken Rite are just a few of many great bands in the area. I know there are more and I do apologize for not mentioning them. So many good bands here in Edmonton. Who are you all-time top five Canadian metal bands? Annihilator, Protest The Hero, Diemonds, Rush, Anvil. Be sure to follow us on Facebook and Instagram and visit our website. Our drummer Ryan has a YouTube show called “In The Jam Room” where he films local bands in their natural habitat (The Jam Room) with a live performance off the floor and an interview. It’s a great show and a great way to people to find new artists in the area. Keep an eye on our page this year as we plan to release a single every 2-3 months. We want the music to come out more regularly. We’d also like to thank Heavy Music Headquarters again for this opportunity and thank you to everyone who took the time to read this. Thank you to all our current fans and new fans. Thank you so much.